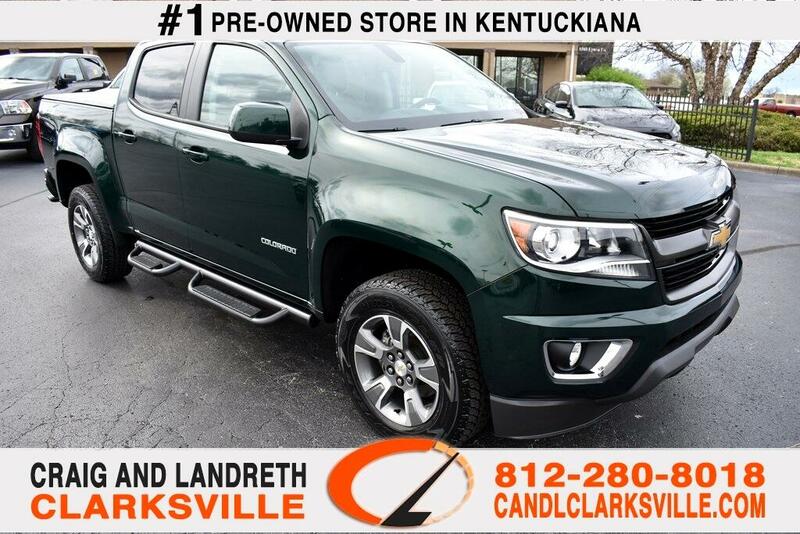 CERTIFIED BY CARFAX - NO ACCIDENTS 2015 CHEVROLET COLORADO Z71 CREW CAB ** 4WD/4X4/AWD ** ONLY 29,000 MILES ** LOCAL TRADE AND COMES WITH A PHENOMENAL PREVIOUS OWNER RECOMENDATION ** JUST ARRIVED ** THIS IS A NON SMOKER, GARAGE KEPT COLORADO AND WHEN WE SAY SHOWROOM CONDITION THIS TRUCK IT EXACTLY THAT...... FACTORY NAVIGATION ** HEATED LEATHER SEATS ** BOSE PREMIUM AUDIO ** BACKUP CAMERA ** STEP BARS ** TOO MANY OPTIONS TO LIST ** SUPER CLEAN CARFAX ** YOU WILL NOT BE DISAPPOINTED WITH ANYTHING ON THIS VEHICLE AND IT IS SITTING ON THE SHOWROOM FLOOR! ANY QUESTIONS CALL RICHARD SPAN, JAKE SMITH, OR JIMMY SMITH JR AT 812-280-8018!! WE'VE NEVER LOST A DEAL WHEN IT CAME TO PRICE OR QUALITY!! Fresh oil change, White glove detailed, 110 point safety inspection, Bluetooth, USB, Heated Seats, Remote Start, Navigation System, Keyless Entry, Satellite Radio/ Sirius XM, 2nd Row Bench Seating, Parking Sensors, Parking Assist, Towing Package, 4WD, All Wheel Drive, Premium Audio, Non-Smoker, Lots Of Options, Backup Camera, Bose High End Sound Package, Premium Package, Premium Plus Package, Premium Sound Package, Premium Wheels, Technology Package, Tow Package, Trailer Package, Certified. Certified by CarFax., Audio Package, Heat Package, Remote Start Package, 4WD, Bose Premium 7-Speaker Audio System Feature, Heavy-Duty Trailering Package, Preferred Equipment Group 4Z7. Odometer is 14097 miles below market average!